I’m a codependent cat owner and a codependent gardener. I’m hesitant to stand up (or move, really) if there’s a cat snoozing in my lap. I’m hesitant to pull plants that more practical gardeners would call weeds just because I didn’t intend them. 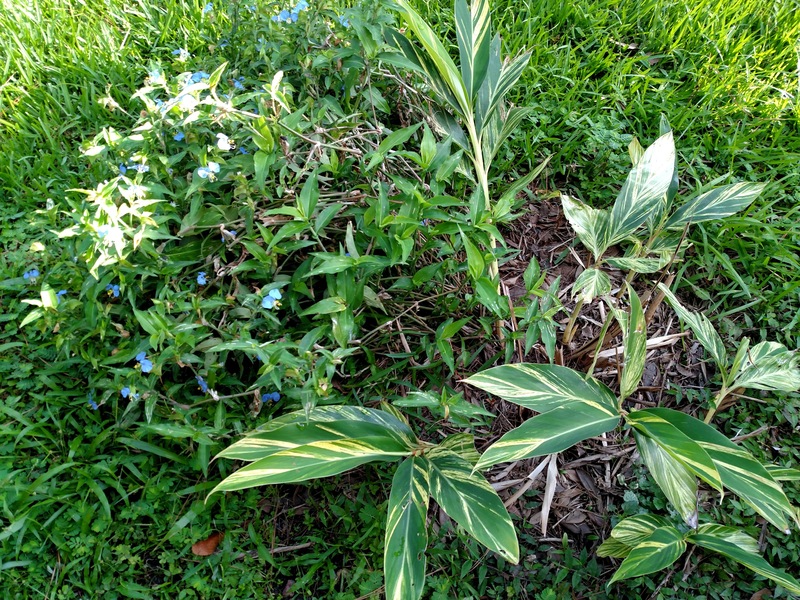 Unless they cause a problem for other plants, I’m apt to allow “weeds” to grow just to see what happens. In this case, I know the dayflower. I must have seen it in this neighborhood in my childhood, because I have a childlike fascination with it. The delicate flowers are beautiful, and they only bloom in the morning. They close up in the afternoon and greet you again the next day. The Swedish botanist Linnaeus named this plant for the three Commelin brothers, Dutch botanists, two of whom were very productive in their field. The third brother published nothing and was relatively unknown. Linnaeus used the flower’s three petals to represent the traits of the three brothers. For weeks I had been watching the dayflower through the kitchen window. 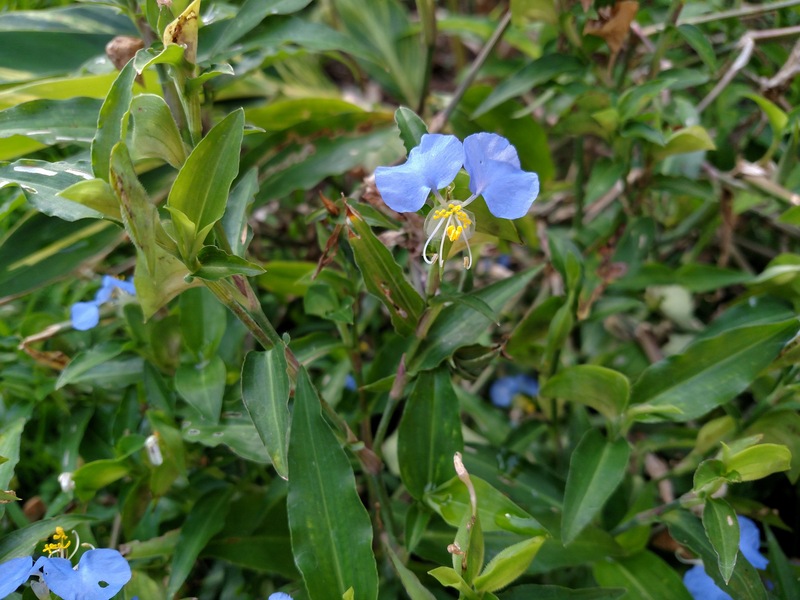 I enjoyed seeing the little blue flowers attract bees and the occasional butterfly. I finally realized, admitted to myself, really, that the dayflower was stunting the progress of the ginger. 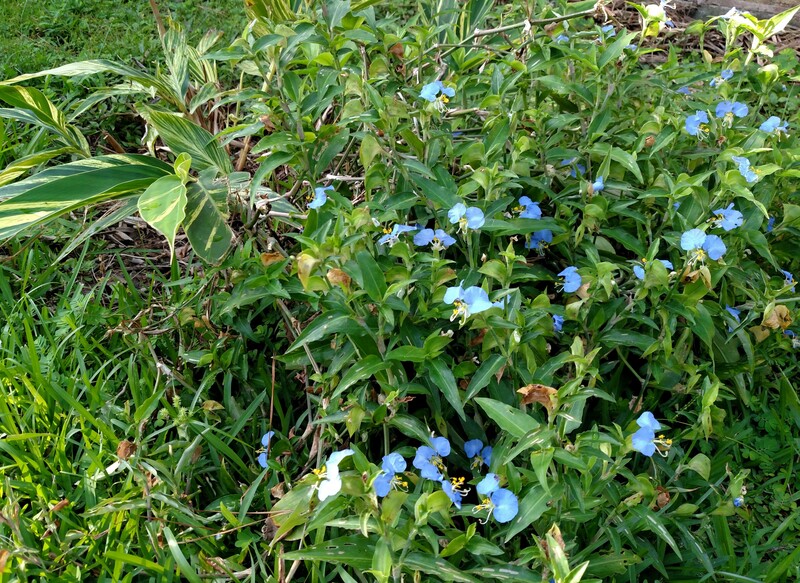 As the north side got more sun, the dayflower flourished, providing moisture and shade for the ginger at the cost of its growth. When I investigated, I saw that the dayflower spreads and sprawls, and I was able to gently move it aside intact like a bedspread. To give the ginger even more space, I pulled some of the “weeds” that had taken advantage of the moist shade under the blanket. Now both have room to grow.